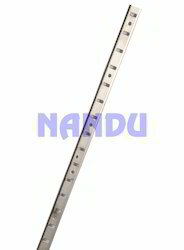 Providing you the best range of mini adjustable single slotted channel with effective & timely delivery. 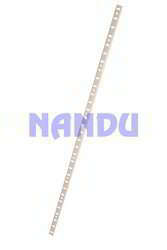 We are counted as consistent firm actively involved in developing modern day Mini Adjustable Single Slotted Channel. Fabricated specially to support display racks, these adjustable channels come with slotted design which improves its flexibility and versatility. We are utilizing premium grade mild steel material to manufacture the robust quality channels, which are accessible in 4ft and 6ft sizes at a market leading price. We are actively engaged in manufacturing and supplying a superior quality assortment of Mini Adjustable Single Slotted Channel M.S. that is used for assorted applications. Our offered range is precisely manufactured using high grade factor inputs and advanced technology and is in compliance with the set industry standards. In addition to this, we offer this product to our precious clients at market leading prices.